Fresh drinking water is valuable stuff for long-distance sailors, so why not rig up a couple of rain catchers and collect it whenever there’s a decent downpour? Clean fresh water from the sky and, much like the wind we also depend on, it’s free. Underway, a bucket slung on the end of the boom is supposed to catch rain water as it pours off the mainsail. In practice, I’ve found that most of the water misses the bucket, the motion of the boat prematurely empties it, or the bucket falls off just when it’s nearly full. The system works much better if you can encourage the rainwater to run to the gooseneck end of the sail, perhaps by tensioning the topping lift. If your sailboat sports a loose-footed mainsail with slab reefing, you’ll need to pull a slab in so that the water collects in the folds which soon fills to overflowing and acts as a gutter. If you’ve got in-mast furling, then this approach isn’t going to work at all. Hah! 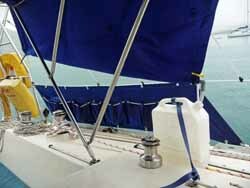 Many long-distance and live-aboard sailors adapt their biminis or cockpit awnings for collecting rainwater, often by incorporating a plastic gutter along the sides of it. We use a different approach on Alacazam. Our bimini has roll-down side screens, to keep the sun off us when the boat is heeled, and it’s these that collect rainwater for us. They roll down in two stages – halfway down and all the way down. In the halfdown position, the remaining section is lashed back up, which creates a kind of envelope and catches the rainwater as it cascades down the sides. Some plastic pipe fittings and a clothes peg completes the lash-up. It was my idea – blindingly clever! 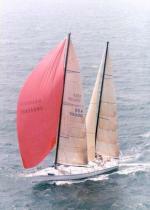 A ketch or yawl rig makes it relatively easy to support a tailor-made rainwater catcher. On this very attractive Hinckley yawl the skipper has made up a bespoke fabric rain catcher specifically for the purpose, using the the shrouds and the masts to support it over the boom. A raincatcher device like this one, properly tensioned so that the wind won’t throw it all out, can fill your tanks in a couple of hours in a tropical downpour. Providing the first few gallons of water are discarded and the fabric is sluiced clean of any salt, insects or by-products of over-flying birds, then the water is normally clean enough to drink. Depending on your level of confidence in its cleanliness, the water can be either plumbed directly into your tanks, or collected in plastic containers. We choose the latter approach, treating the contents to a water purification tablet – as rainwater will otherwise grow bacteria rather quickly – before transferring it to Alacazam’s tanks. Other skippers say it’s necessary to have several filters in the rainwater catchment system and to keep that water in a separate tank, even then only drinking it after boiling. If you take the filtration route, the primary filter can be something as simple as a paper coffee filter or piece of cheese cloth, which will keep any larger solids from passing through. The second should be between the rain water tank and the pump. This should be a standard household type freshwater filter with a 5 micron filter or so. The third should be a carbon filter between the pump and the tap. Without a watermaker or raincatcher, you’ll have to resort to frequent trips ashore with the jerrycans, or to taking the yacht alongside from time to time. But water can be scarce in many parts of the world, particularly during the dry season, so it seems a little discourteous to expect the local people to share their limited supply with you. We cruising sailors should be self-sufficient wherever we can. Whatever the source of your water, a battery-powered water tester (such as the Liquatec PM-3000 TDS Pocket Meter) can be used to assess its purity by measuring the Total Dissolved Solids (TDS) in Parts per Million (PM). But a TDS meter works by measuring the electrical conductivity of water. 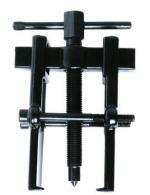 Therefore, it’s only able to measure dissolved substances that are ionised in solution, such as sea salt for example. Specifically, it will not indicate the presence of non-ionized substances such as bacteria, viruses or soluble chemicals.